The Power With.in - Your Online Resource for Conscious Living: Is meditation really necessary for 'Waking Up' and becoming aware of oneself? I've always known that meditation is something that a lot of people do and find important, but I'm honestly not really fond of it. Is meditation really necessary for 'waking up' or becoming more aware of oneself? The Answer to this Question might be interesting for all of you to know. For many people, if they even do choose to start meditating, find that it is not that comfortable and that is no surprise. Most people have been conditioned since their early days to continuously make themselves busy with all kinds of activities to fill their day. You have probably heard or even yourself said something like "I am so busy, I don't have time for this now.". It is very unlikely for people to take time to simply Be. It seems that people are almost afraid to stop doing something, to not be busy, because then you will end up being just by and with yourself, and yes, this is scary to quite a lot of people even without realizing it. But even this, you cannot avoid. The first thing in the morning and the last thing by the end of the day, you are going to be confronted with yourself. You might have had experiences when you are not able to fall asleep, because your mind just wonders round and round so much stuff and it seems that it never stops. Fortunately, there is a solution for that. Yes, Meditation really does help to slow down the mind activity or even to stop it. But not everyone is willing to step into that, since what you are going to find there is you and your mind, which seems to be almost like your enemy at certain points. It is really effective in becoming more aware of oneself, since there's nothing else there once you meditate, but oneself. Is it necessary for being aware of oneself? Not necessarily. Even though it does help significantly, this is not really needed. The fact that people use it for self-awareness does not mean that it is necessary to use it. There are numerous ways to become more conscious of oneself, but an important factor of that is that you have be with yourself without indulging in useless mind activity. Find what you love to do, what gives you great joy, and do it. At that moment, you are doing nothing but just being conscious of yourself. You cannot do something with high intensity if you are not being there at that moment fully. People who play music, do sports, yogis, extreme sport lovers, they all essentially do it for the one, same thing: To Be fully present and experience the moment completely. If you find that there's something that you love to do, you might also find that while doing it, you are aware of yourself more than other times. Become even more aware of that moment, become conscious of your awareness, and you will find deep joy within. What does it mean to 'wake up'? To 'wake up' is to transcend unconscious everyday suffering into conscious joyful daily living. This comes with full realization of oneself. Is meditation necessary for 'waking up'? No. 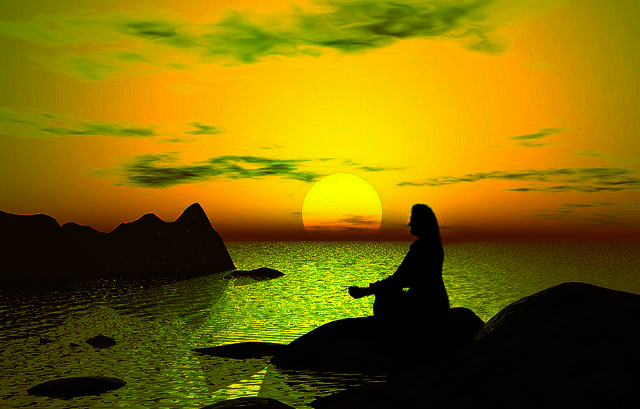 There are many people who have 'woken up' without meditation. However, this may have been accompanied by great suffering wherein their mind could not take it anymore and have given up. The moment you 'wake up', you can also become conscious of oneself. It is a fact that meditation is helpful for 'waking up', but it is not necessary. What it does is that it brings your attention to here, so now you can be conscious of what is happening in you. Start by feeling your hands, and then slowly spread that sensation around your whole body. Be conscious of your body throughout your daily activities. Feel your breath throughout all the activities during your day. Just simply be aware of your breathing. Count in your head from one to ten and then back to one, whenever you find that you need focus. Meditate, but do it without any intentions. Just sit and be aware of what is happening at this moment. Ask yourself: "I wonder what is my next thought going to be?"